To run smooth business operations, a business entity ends up making huge investments. Be it buying machinery or hiring an employee; a company needs to undergo an in-depth analysis and the incur the final cost. Now, the investment decision turns out to be challenging as well as the assets purchased are to be maintained adequately. The decision becomes more valid if an expert investigates the matter and presents its viewpoints. The United Arab Emirates is a known business platform that attracts millions of newbies as well as experienced business professionals. The nation also demands the business organizations to have a word with External Asset Managers to get a better understanding of Asset Management, improve liquidity and grab the best investment opportunities. Once you have made up your mind of setting up a business in UAE, be it a start-up or expand an established one, it’s time for you to know about External Asset Management (EAM). Let’s dive in. The rising number of business entities in the global world has proportionately increased the demand for the maintenance of company assets as well as the maintenance of company wealth. Initially, this was handled by private banks, but then the concept of entrepreneurship provoked the relationship managers to take a step forward and establish EAMs. Now, you must be wondering what EAM is all about? In short, we can say that an EAM firm acts as a catalyst that helps business entities to understand investments, handles the core business assets, provide tailor-made solutions according to the industry requirements. It is a standalone company that is independent of banks. To ensure continuous support, an External Asset Manager comes into the picture. Let’s understand who he is and how he helps. Who is an External Asset Manager? An asset manager can be stated as a wealth manager who provides extensive services to business clients to manage funds for individuals as well as companies. They are subject-matter experts who are known for making timely investment decisions. An asset manager helps a business to diversify the investment portfolio that ultimately helps to boost the goodwill of the company. Let’s take the next step of understanding how EAM works. 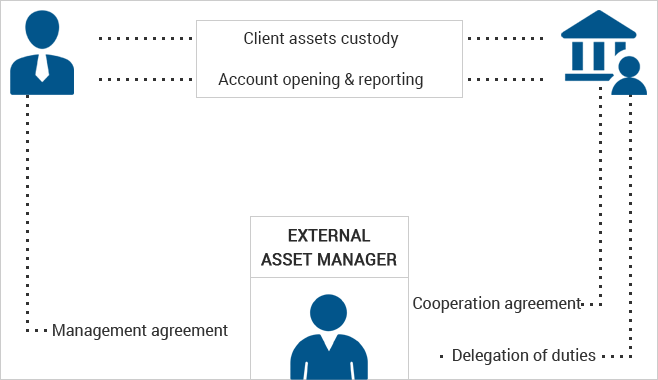 How an External Asset Manager Works? Note: External Asset Managers can’t withdraw or transfer funds directly, and control remains in the hands of the business owner. Our wealth advisors will understand your business requirements and cater to the needs accordingly. If you hold any doubt or want to have a word with our consultant to take your first step, do contact us-we’d be glad to assist.